Another day, another universe! I chose to do the golden sunset behind their warm brown wings for this one, covering both orange and yellow in one panel for my rainbow of AUs. Wingfic is also pretty self-explanatory, though there’s as many variations on it as there are authors. Sometimes they can fly and sometimes the wings aren’t usable, sometimes they’re angels or demons or just freaks of nature. Sometimes it’s just one or the other of them that has wings, and sometimes it’s a whole world full of flying humans. 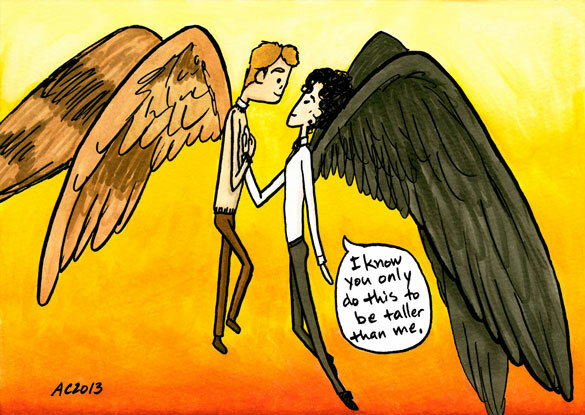 Alternate Universes: Wingfic, 7″x5″ pen & ink and Copic marker on paper. Get the full comic as a print on Etsy.